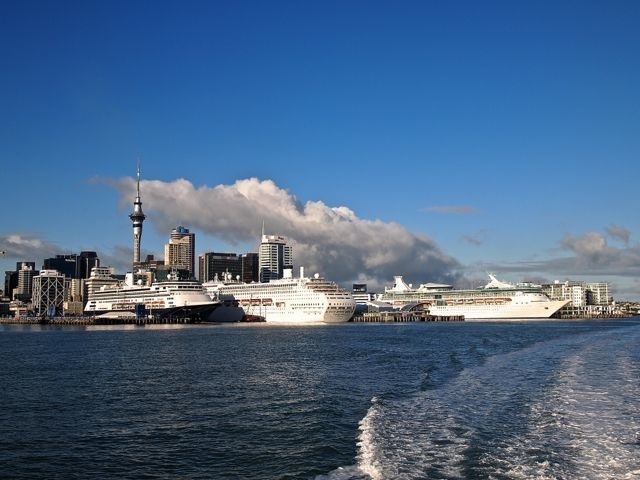 The heart of Auckland city is 5 minutes from your ship. The principal wharf is even closer to many lively bars, restaurants and cafes, the Ferry Terminal, the Maritime Museum and historic vessels. The port is right beside the Auckland CBD and is situated on the Waitemata Harbour – sometimes referred to as the jewel in Auckland’s crown. The name means “sparkling waters” and on sunny days the reason is obvious. It is a recreational playground and you will see thousands of boats, large and small, taking advantage of the sheltered waters and many beautiful islands nearby for fishing, swimming, kayaking, yacht racing, etc. 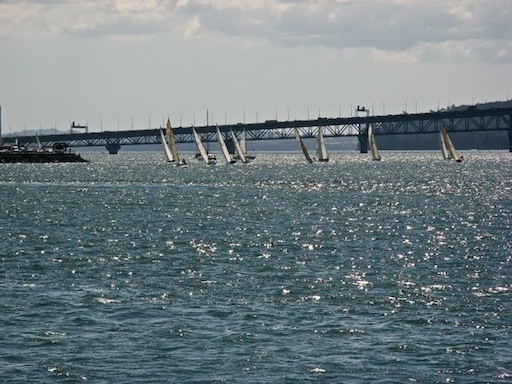 Auckland is reckoned to have the highest per capita boat ownership in the world. 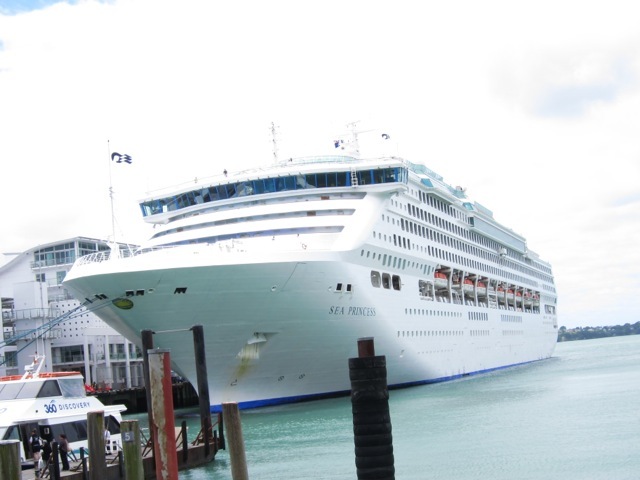 The majority of cruise ships berth at Princes Wharf, right beside the Ferry Terminal – particularly convenient if you wish to spend a couple of hours in the attractive and historic suburb of Devonport, a 12-minute ferry ride away. 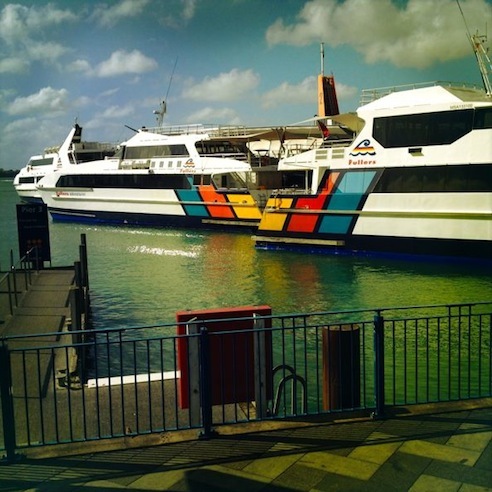 Ferries depart every half hour and the return fare (at July 2012) is NZ$11. The New Zealand Maritime Museum is just the other side of the wharf, and it offers a fascinating insight into the country’s intimate relationship with the sea from the earliest arrival by the Maori, to the present day. One-hour public sailings are also offered on the replica historic vessels. The ‘Viaduct Harbour’ is not much further away, where many luxury superyachts are moored and which was the base for the competitors in the America’s Cup regattas of 2000 and 2003. The area is surrounded by a huge variety of bars, restaurants and cafes, and if you feel inclined to walk a little further, the newly redeveloped Wynyard Quarter houses yet more. The Quarter also contains a fish market, an historic tram (the only one in Auckland), art installations and plenty of space to stroll or just watch the world go by. The hop on, hop off Explorer Bus service departs every 30 minutes from the Ferry Building. An all-day bus pass costs NZ$40 (as at July 2012) and stops at a variety of attractions. www.explorerbus.co.nz. 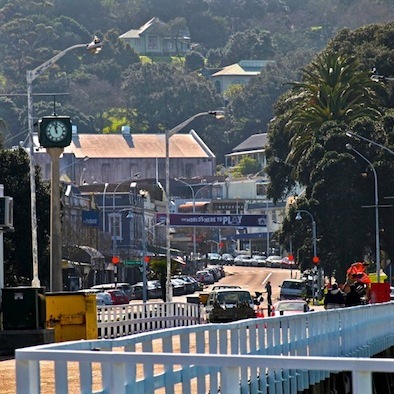 Take the ferry to the historic suburb of Devonport (12 minutes from the city centre, NZ$11 return, every 30 minutes) There is an attractive main street, with no shortage of boutique shops and excellent cafes. There are also sheltered beaches, a Navy Museum and – for spectacular panoramic views over the city, harbour and Hauraki Gulf – Mt Victoria and North Head are only a 10 and 20 minute walk away. Ferry operator website: www.fullers.co.nz. 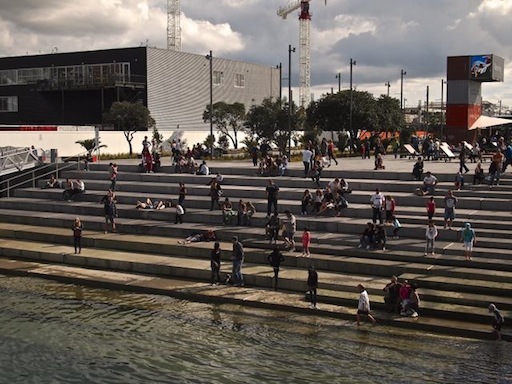 Take a walk along the North Wharf promenade in the Wynyard Quarter, about 10 minutes from the cruise ship terminal. This newly redeveloped area was previously used for port related activities and fuel storage, but is now beautifully landscaped, incorporating art installations, numerous cafes, bars, restaurants, a fish market, fishing boats, superyacht berths, views of the harbour, a historic tram ... and a piano for all to play! Visit the Observation Deck of the Sky Tower, the Southern Hemisphere’s tallest building, for great views of the city and harbour. There is also the SkyJump and SkyWalk for the adventurous. www.skycityauckland.co.nz/Attractions/Skytower.html. 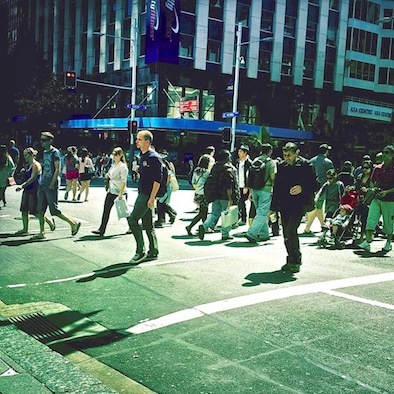 Discover the central city on a guided heritage walk. 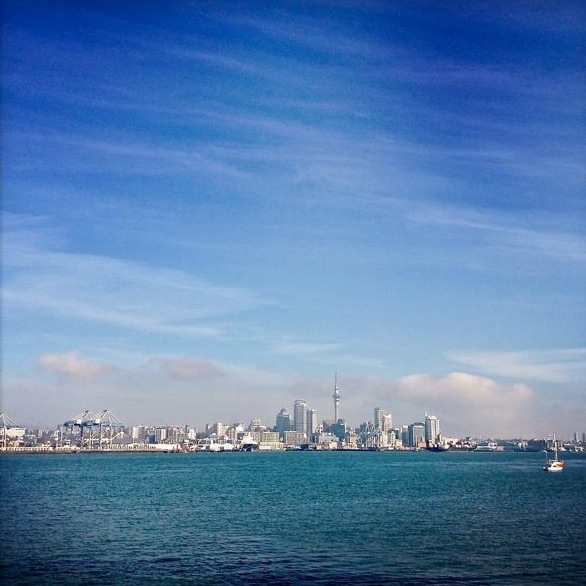 Get an insight into local culture and the story of Auckland. Two hours, cost NZ$30 (July 2012) with an option to include lunch. Bookings essential. www.aucklandwalks.co.nz. Book a half-day or one day tour and go a little further afield. Visit vineyards, the Waitakere rainforest or the wild west coast beaches including Karekare, where ‘The Piano’ was filmed. For keen ‘Lord of the Rings’ fans there is even a Hobbiton Express Tour. There are many operators, including: www.bushandbeach.co.nz and www.milestonetours.co.nz. 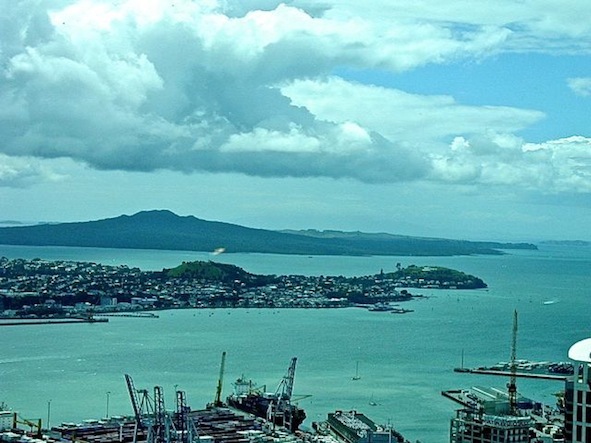 Take a ferry ride to Rangitoto Island (approximately 20 minutes from the city centre, NZ$27 return), the iconic volcano in Auckland’s Hauraki Gulf. Rangitoto is the largest and most recent volcano in the Auckland Volcanic Field, and was formed by eruptions that took place a mere 600 years ago, making it of particular interest to geologists internationally. 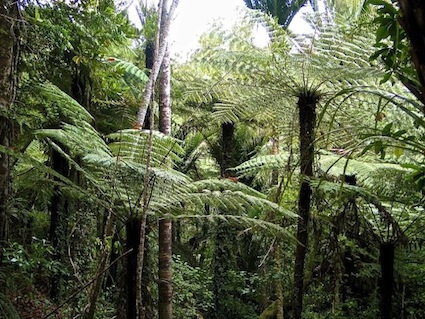 It also has the largest pohutukawa forest in the country. The volcano is now considered virtually extinct so a walk (or take the 4WD road train) to the top will offer nothing other than the fantastic 360° views of Auckland and the islands of the Hauraki Gulf, right over to the Coromandel Peninsula. Ferry operator website: www.fullers.co.nz. 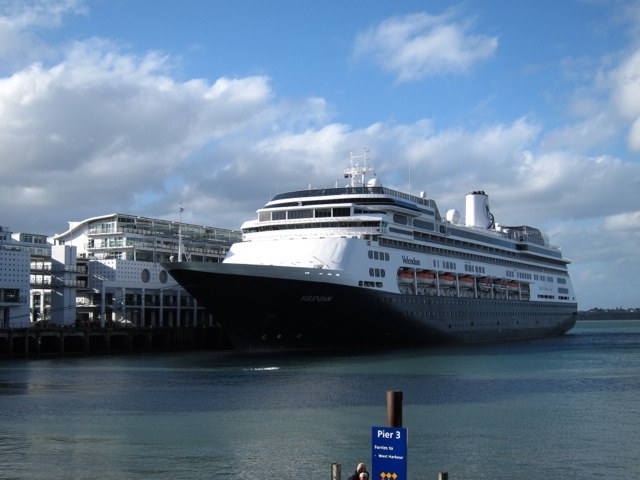 For a more adrenalin-fuelled seagoing experience there are jetboat rides and the chance to sail on an America’s Cup boat, all within a couple of minutes of the cruise ship terminal. SHOPPING: Queen Street (5 minutes walk from the cruise terminal) is the main shopping street featuring all the main chain stores. However for the unique boutique experience, head to High Street – running parallel to and just one block east of Queen Street. The inner suburbs of Parnell, Ponsonby and Newmarket also offer a great variety of shopping experiences, and all are accessible via the Inner Link Bus – a loop bus service running in each direction approximately every 10 minutes during the day (NZ$1.90). Area: 483 km²/186 sq. mi. Language: English. Maori (particularly in placenames) and many Asian languages are also widely spoken. Temperature: New Zealand has a warm temperate climate, with temperatures ranging from 22-25C in summer, to 11-14 in winter. Bear in mind that the NZ seasons are the reverse of the Northern Hemisphere. The summer months are December to February, the winter months are June to August. Winter temperatures are usually fairly mild. Opening hours: Most shops are open from 9 or 10am until 5 or 6pm every day. A few shops do not open on Sundays. Some banks close at 4.30pm. Timezone: New Zealand Standard Time. UTC/GMT +12 hours. Daylight Saving Time (DST) in effect October to March inclusive. The City Link (red) buses run up and down Queen Street from the Britomart Transport Interchange to Karangahape Road (K-Rd) and back. The service runs approximately every 7-8 minutes. Every 15 minutes the route includes the Wynyard Quarter. Fare 50c. The Inner Link (green) buses run around the city, in two directions, from the Britomart Train Station, via Parnell, the Auckland Museum, Newmarket, Karangahape Road (K-Rd), the hospital, Ponsonby, Victoria Park and the Sky Tower. Services run approximately every 10 minutes. Fare $1.90. The Outer Link (orange) buses run in a larger loop through the inner suburbs of Auckland, in two directions. Services run approximately every 15 minutes. Fare $1.90 to $3.40. New Zealand society is relaxed and welcoming. The locals will strike up a conversation with a visitor very easily. This can be an excellent way to learn about the national character and you may also find out useful local information, not found in guidebooks. TIPS: Tips are not expected anywhere, though are appreciated – particularly in hotels and restaurants – for exceptional service. You may tip at your discretion, approximately 10%, for meals or services. DRESS CODE: The dress code is informal and shorts are acceptable in most places. Smart casual is the norm for most restaurants and men are not generally expected to wear suits and ties. Away from the city centre you are quite likely to see people going barefoot in summer, particularly children. Social interactions are generally informal and first names are frequently used, rather than 'Mr' or 'Mrs'. 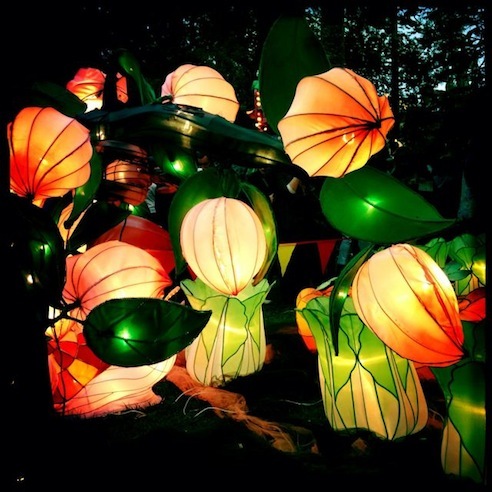 Auckland is a multi-cultural city and you will find many Polynesian and Asian influences, particularly in the wide variety of restaurants, which offer a broad selection of Asian food. Polynesian and Maori design elements can be seen throughout the city. Clothing advice for Auckland is be prepared for temperature variations. The direct heat of the sun can be quite intense, while in the shade the temperature can be much cooler. Wearing layers or carrying a light jacket is the best option. On sunny days you will also need sunglasses and ideally a hat. Don’t forget to apply sunscreen regularly – the sun is deceptively strong and it is easy to get sunburnt, even if the air temperature feels cool. AUCKLAND MUSEUM is one of New Zealand’s most important museums, housed in one of the most iconic buildings in Auckland. It is located in Auckland Domain, a beautiful park which also features a large, traditional-style Winter Garden and a tranquil duck pond. Among it’s many fascinating displays, the museum includes superb examples of Maori carving, plus an authentic Maori cultural performance which takes place every day at 12pm and 2:30pm. You can experience traditional singing and dance, including the world famous ‘haka.' www.aucklandmuseum.com. Open 10am-5pm daily except Christmas Day. Museum entry is by donation: $10 per adult is suggested. VOYAGER NEW ZEALAND MARITIME MUSEUM on Hobson Wharf is a stone’s throw from the cruise ship terminal and is among the best maritime museums in the world according to the visitors. The replica steerage class accommodation from an 1840s immigrant sailing ship is one of the highlights. You can compare your cruise ship experience with the cramped and gloomy, (toy) rat-infested cabin which rocks realistically, while animated projections and audio narratives bring it to life. 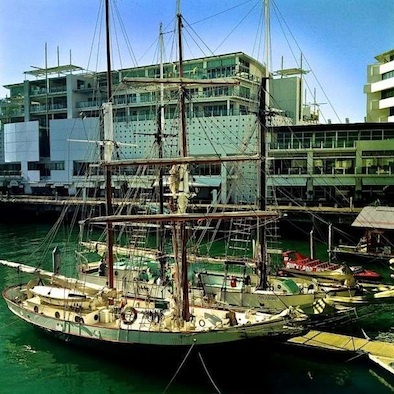 The museum also features historic sailing vessels that offer regular, one-hour public sailings on the beautiful Waitemata Harbour. Apart from anything else, the trips offer fantastic photo opportunities! www.maritimemuseum.co.nz Open 9am-5pm daily except Christmas Day. Museum entry costs NZ$17, museum entry plus harbour sailing costs NZ$29. KELLY TARLTON’S ANTARCTIC ENCOUNTER AND UNDERWATER WORLD houses an underwater viewing tunnel with moving walkway, and New Zealand’s only colony of Antarctic (King and Gentoo) penguins. kellytarltons.co.nz. Open 9.30am-5.30pm, 365 days a year. Entry costs NZ$34 per adult. There is a dedicated, free shuttle service which departs from opposite the cruise ship terminal. 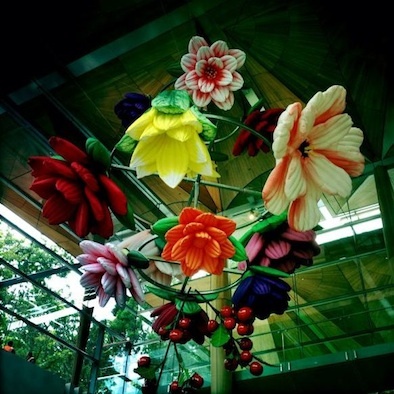 AUCKLAND ART GALLERY – New Zealand’s oldest and largest public art gallery – is a 20 minute walk from the waterfront. It re-opened last year after a spectacular, award-winning redevelopment. The collection includes historic, modern and contemporary art from New Zealand and the Pacific, as well as internationally important art from 1376 to today. It adjoins the scenic Albert Park and incorporates an excellent cafe. Open 10am-5pm daily except Christmas Day. Free entry (excludes special exhibitions). www.aucklandartgallery.com. The maximum summer temperatures in Auckland City are never extreme being generally in the 22-28°C (70-82°F) range. However, the direct heat of the sun can be quite intense and it is very easy to get sunburnt within a short time. Regular application of sunscreen is a must when outdoors, even if the air temperature feels cool and you are only exploring city streets. Sunglasses and a hat are important accessories! Even in summer, temperatures in the shade can feel much cooler than in the sun, especially if there is a breeze. Wearing layers or carrying a light jacket is advisable even on sunny days. 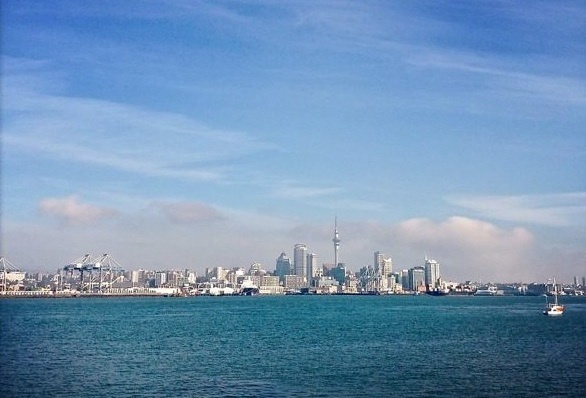 Because of Auckland’s maritime climate, winter temperatures are never extreme either. The daytime temperatures rarely go below 10°C (50°F) and are usually in the 12-16°C (54-60°F) range. Though the weather can be wet and windy, the winter climate is also very changeable, so what starts as a miserable day can often become sunny and calm later on. Beautiful, crisp, clear days are common throughout winter.